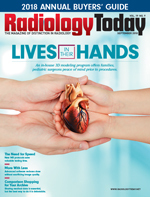 Innovation is the latest buzzword in radiology. With the added emphasis on value-based and patient-centric care, doing things faster and more efficiently has never been more important. With that in mind, this month's features deal with resourceful means of delivering care and/or better allocating resources. First up, our cover story details the 3D printing program at Nemours Children's Hospital in Orlando. The hospital runs the program in-house to save time, assist in treatment planning, and educate patients. Kathy Hardy speaks with some of the professionals who developed the program about how they got it off the ground, how it's changed the way they deliver care, and what it's meant to patients and their families. Next, Beth W. Orenstein reports on new MRI protocols that are helping to reduce scan time. The length of most MR scans not only contributes to costs but also affects patient satisfaction. Long scans can be uncomfortable—unbearable for some patients—and patient movement may necessitate rescanning due to blurry images. Shorter scans can make the process more palatable to patients while allowing more scans to be performed—a win-win situation. Getting more productivity from a resource is another win. Keith Loria takes a look at ways to get better images from standard or smaller doses of radiation. Methods range from new software that processes images more efficiently to new hardware that makes better use of dose, but the ongoing emphasis on dose reduction—and the associated reduction in lifetime cancer risk—makes these types of efforts ever-popular and ever-important. Finally, we consider the relative merits of vendor-neutral archives and enterprise PACS. The article is an extension of a session from the 2018 Society for Imaging Informatics in Medicine meeting. We caught up with the three principals from that session to get their thoughts on the best ways to share images across the enterprise. Each method has its plusses and minuses, but the key is to optimize the solution—whatever that solution may be—to fit the needs of your organization. The experts offer useful insights into how this can be accomplished and how health care providers can get the most out their often-limited resources.